At school we run the Cracker Jacks sports programme with our PE and Health curriculum. Westminster Christian Schools tries to offer sport that the students and parent body are interested in getting into. Each sport requires a registration fee. Most practices are held at the school either after school or during lunch. 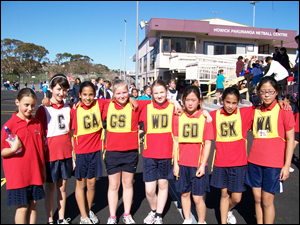 We offer netball for Year 1–8 (depending on team numbers) in the Kidzplay or Netball North Harbour competitions. Westminster has formed a partnership with Windsor Park. Windsor Park is a football club with a Christian heart. We organise registration for our students through the office and supply mustere dates etc. We aim to get all Westminster students playing in the same team as their friends. If we have enough students to form a full Westminster team we will play it under the Windsor Park Club banner, with Westminster as the team name. The Year 1– 6 play miniball or basketball at North Shore Leisure Centre (Browns Bay). Intermediate pupils can play boys/girls/mixed basketball at North Shore Events Centre in half yearly tournaments. Our teams begin from Year 1 and go up to Year 8 (depending on numbers). Westminster Christian School is able to offer touch teams from Year 1–8 (dependent on numbers).